On the 8th of March 2019, she has moderated the round table discussion titled “The relationship to the environment is a mirror image of our society” (SI: Odnos do okolja je ogledalo naše družbe), hosted in Castle Brežice, a part of the European project Green Posavje (SI: Zeleno posavje - za naravo in zdravje). The aim of the project is to raise awareness among the inhabitants of the Posavje region about the importance of nature conservation and ecology. Reuse and other circular economy concept, sustainable use of water resources and decreasing food waste are ways in which this can be done. In addition, the project wishes to decrease the quantity of municipal waste at the source: mainly biological and plastic waste. The main partner of the project is Javno podjetje Komunala Brežice. Other partners include Kostak, avno podjetje Komunala Sevnica, Javno podjetje Komunala Radeče in OKP Rogaška Slatina. The report from the round table is available here (in SLO). 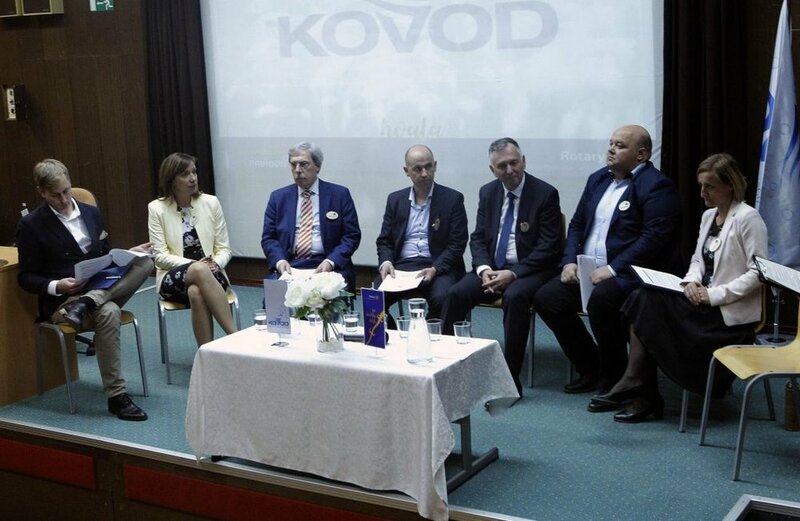 On the 21st of March 2019, the Postojna Cerknica Rotary Club hosted a consultation and round table about the circular economy titled Circular Economy - Future Challenges. Besides Ladeja Godina Košir, the other speakers included State Secretary mag. Aleš Cantarutti, Chairmain of the Board of the SID bank mag Sibil Svilaln, Chairman of the Board of Pivka Perutninarstvo mag. Janez Rebec and Director of the Association of the woof and furniture industry at the Chamber of Commerse Igor Milavec. The key message of the discussion was: the circular economy is our inevitable future, necessary for environmental and economic reasons, especially if companies wish to remain competitive on the global market. Ladeja emphasized the need for a systemic approach and multi-stakeholder collaboration. Despite many positive examples of circular economy implementation among companies, creative industries and NGOs, she stressed, Slovenia is lacking inter-sectoral coordination and a clear action plan for implementation on the state level, which the government representatives present at the event have also confirmed. There is a persistent lack of understanding of the positive impacts that the transition towards a circular economy brings on the economic, environmental and social level. Ladeja thereby pointed to two opportunities for Slovenia to present its successes and encourage international cooperation: World Expo in Dubai and the presidency of the Council of the European Union in 2021. Forming new partnerships, exchanging best practices, knowledge and innovative/creative approaches is much needed on the local, national and international levels. More information about the event available here (in SLO). Are you an impact maker? Apply for the 2019 Social Innovation Competition!